Driving is our second priority. Your child is our first. Be at the stop on time. Never run to or from the bus. Wait at your designated stop in a safe place, well back from the side of the road. 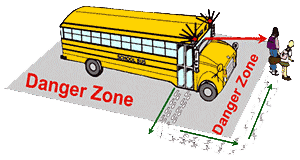 Remember never to stand in the danger zone that surrounds the bus. The danger zone is anywhere close enough for you to touch the bus. 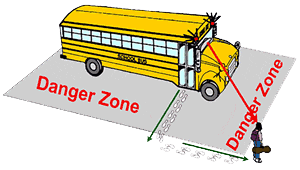 The bus driver cannot see you when you are in the danger zone. come to a complete stop. Look for the stop arm to come out and for the flashing red lights. signal for you to cross the street – but continue to watch for traffic yourself. Keep the aisle and the emergency exits of the bus clear at all times. Never throw objects inside or outside of the bus. Talk quietly. The bus driver needs to concentrate to safely drive the bus. Never fight, shout, or use obscene language at any time. Do not bring dangerous, disturbing or annoying objects onto the bus. 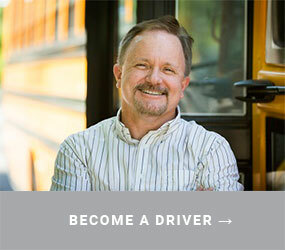 students/driver that have food allergies and anaphylaxis, prevents choking and maintains bus cleanliness. The 10 giant steps (or 3 meter) rule is a good measurement for children to identify the danger zone around the school bus, particularly when crossing in front of the bus.